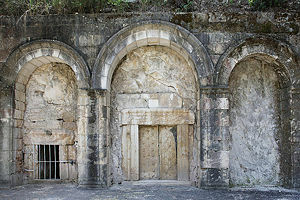 Entrance to the traditional burial cave of Judah HaNasi at Beit She'arim. Another tradition holds that he died and was buried at Sepphoris, where he spent the final years of his life. Rabbi Judah haNasi, (Hebrew: יהודה הנשיא—"Judah the Prince") (135 – 220 C.E. ), was a key leader of the Jewish community of Palestine during the occupation of the Roman Empire. The title nasi refers to his role as president of the Sanhedrin (ruling Jewish legal council), but may also be related to the fact that Judah was supposedly of the royal line of King David, hence the title "Prince." He is best known as the chief redactor of the Mishnah, the seminal collection of rabbinical opinions which form the core of the Talmud. Unlike his great predecessor Rabbi Akiva, who supported the revolt of the messianic leader Simon Bar Kochba, Judah haNasi maintained cordial relations with Rome and was said to enjoy a personal friendship with at least one Roman emperor. As a result, the situation of the Jews of Palestine generally improved during his long patriarchate. His most important contribution to Judaism, however, was his redaction of the Mishnah, which forms the foundation for all later rabbinical tradition. Judah thus marks this transition from the era of the ancient Mishnaic sages known as the Tannaim to the era of the early Talmudic commentators known as the Amoraim. His contribution to the literary tradition of Judaism can hardly be overstated. Judah haNasi was born in 135 C.E. According to one tradition, he came into the world on the same day that Rabbi Akiva died a martyr's death (Midrash Genesis Rabbah lviii.) The Talmud suggests that this was a result of Divine Providence: God had granted the Jewish people another leader of great stature who would eventually succeed Akiva. Although the two leaders shared many opinions regarding Jewish law, they were polar opposites in terms of their attitude toward Rome. Whereas Akiva had supported Simon Bar Kochba's violent revolt against the Romans, even declaring him to be the promised Messiah, Judah haNasi was a trusted friend of Roman emperors, whose influence helped the Jews improve their lot after decades of suffering from Roman repression. Judah's place of birth is unknown. His father, Shimon ben Gamliel II, had probably been at the fortress of Betar with Bar Kochba when it fell to the Romans, but he managed to escape the massacre (Gittin 58a; Sotah 49b). On the restoration of order in Palestine, the western Galilean town of Usha became the seat of the Sanhedrin, the Jewish rabbinical high court and legislative council. Shimon was elected as its president, this dignity reportedly being bestowed upon him both because of his personal qualities and because of his connections with the house of Hillel, whose attitude toward Gentiles had not been overtly hostile. Shimon was recognized by the Romans as the Jewish patriarch, and his attitude toward Rome must have been basically cooperative. Judah thus spent his youth at Usha in probably the most wealthy and prestigious Jewish home in the Roman Empire. In addition to the classical Jewish texts, his studies certainly included Greek. He is reported to have held that the Jews of Palestine who did not speak Hebrew should consider Greek as the language of their country, while Syriac (Aramaic) had no claim to that distinction. In Judah's own house, pure Hebrew seems to have been spoken. Judah devoted himself chiefly to the study of the Jewish law. In his youth he had close relations with most of the great pupils of Akiva, and a number of anecdotes are preserved by him in the Talmud concerning their discussions. He thus laid the foundations which enabled him to undertake his life's work, the redaction of the Mishnah. His teacher at Usha was Judah ben Ilai, who was officially employed in the house of Judah's father as a judge in religious and legal questions (Men. 104a; Sheb. 13a). Judah also speaks of studying with Akiva's pupils Simeon bar Yochai and Eleazer ben Shammua but not with the famous Rabbi Meir, evidently because of conflicts which made this famous disciple of Akiva unwelcome in the house of the patriarch in his old age. However, Rabbi Nathan the Babylonian, who also took a part in the conflict between Meir and the patriarch, was another of Judah's teachers. In halakhic tradition, Judah's opinion is often opposed to Nathan's. Finally, in the list of Judah's teachers, his own father must not be omitted. As with Rabbi Nathan, the view of Judah's father is often opposed to that of his father in halakhic texts, with Judah generally advocating the more rigorous position. Judah himself says: "My opinion seems to me more correct than that of my father." ('Er. 32a) Despite his willingness to disagree with his father, humility was a virtue ascribed to Judah, and he admired it greatly in his father as well. Eventually, Judah came to succeed his father as leader of the Palestinian Jews. According to a tradition (Mishnah Soṭah, end), the country at the time of Simon ben Gamaliel's death was devastated by a plague of locusts and many other hardships. This may be the reason why Judah transferred the seat of the patriarchate and the rabbinical academy to another place in Galilee, namely, Beit She'arim. Here he officiated for a long time. However, during the last 17 years of his life he lived at Sepphoris, where he settled on account of its high altitude and pure air (Yer. Kil. 32b). Nevertheless, it is at Beit She'arim that his activity as director of the academy and chief judge of the rabbinical court is principally associated. "To Beit She'arim must one go in order to obtain Rabbi's decision in legal matters," says one tradition (Sanh. 32b). The chronology of Judah's activity at Beit She'arim, however, remains speculative. 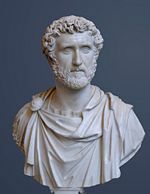 Numerous anecdotes have been preserved in the Talmudic and midrashic literature relating to Judah's relations with the emperor Antoninus, possibly Antoninus Pius (d. 161 C.E. ), many of which are clearly legendary or spurious, since Antoninus was not in office during most of Judah's reign as patriarch. However, Marcus Aurelius is known to have visited Palestine in 175, as did Septimius Severus in 200. Thus, Judah probably did have personal relations with one or more Roman emperors. However, many commentators believe that most of the references to the "emperor" actually describe a relationship with various imperial representatives in Palestine. A great deal of splendor surrounds Judah's position in these stories, to a degree that no other occupant of his office enjoyed. This is likely due to the fact that Judah, more than any previous patriarch, indeed maintained amicable relations with the Roman rulers, who saw him as an important ally in maintaining order among the previously rebellious Jews. Nevertheless there were also periods during Judah's long patriarchate (some 50 years) when the Jews suffered persecution and other hardships. During a famine, Judah supposedly opened his granaries and distributed grain among the needy (B. B. 8a). However, he denied himself the pleasures which could be obtained by wealth, saying: "Whoever chooses the delights of this world will be deprived of the delights of the next world; whoever renounces the former will receive the latter" (Ab. R. N. xxviii.). Many religious and legal decisions are recorded as having been rendered by Judah together with his court (Giṭ. v. 6; Oh. xviii. 9; Tosef., Shab. iv. 16, etc.). Judah was, without doubt, the chief Jewish personage of this period. 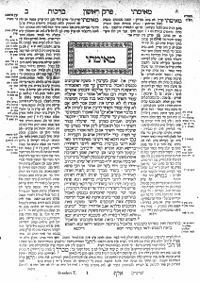 A page from the Talmud, with a section of the Mishnah printed in the center, surrounded by commentaries. Judah's great fame in Jewish tradition, however, is not due to his political or juridical leadership nearly so much as it is to his great intellectual work of compiling and redacting the Mishnah, which in turn came to serve as the core teaching of the Talmud. According to Jewish tradition, God gave the Israelites not only the Written Law but also an Oral Law, both of which were revealed to Moses at Mount Sinai. The Oral Law was passed down over the centuries by the prophets, sages, and rabbis. Fearing that these oral traditions might be forgotten due to the scattering of the Jews after the destruction of the Second Temple in 70 C.E. and the later failure of the Bar Kochba revolt, Judah haNasi undertook the mission of compiling them. His work, which later came to be known as the Mishnah, consists of 63 tractates dealing with rabbinical discussion of Jewish law. No definite statements have been preserved regarding the exact process of Judah's redaction of the Mishnah. However, the Mishnah itself contains many of Judah's own sentences. These are introduced by the words, "Rabbi says," leading to the view that the mature form of the work is not Judah's product. 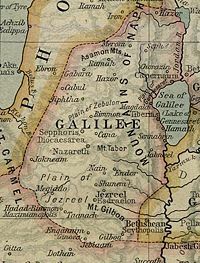 It is thus believed to have been completed after Judah's death by his son and successor, Gamaliel III. Both the Babylonian Talmud and its Palestinian counterpart assume as a matter of course that Judah is the originator of the Mishnah. However, the Mishnah, like all the other literary documents of Jewish tradition, is a compilation of many rabbinical opinions and traditions. Hence Judah is correctly called its redactor, and not its author. The Halakhah (Jewish legal tradition) found its authoritative—though by no means final—expression in the Mishnah. It reportedly follows the systematic division of the halakhic material formulated by Akiva (Sanh. 86a). Judah had no small task in selecting the material that he included in his work. The fact that he did not invariably lay down a decisive rule, but always admitted divergent opinions and traditions of Akiva's eminent pupils, evidences his consciousness of the limits imposed upon his authority by tradition and by conscience. It also set an important standard in Talmudic tradition, by which opposing opinions are included, and more than one view is considered "Jewish" on many controversial issues. Judah HaNasi was reportedly easily moved to tears. He exclaimed, sobbing, in reference to stories of the Jewish martyrs: "One man earns his world in an hour, while another requires many years" ('Ab. Zarah 10b, 17a, 18a). He was frequently interrupted by tears when speaking of the destruction of Jerusalem and of the Temple (Lam. R. ii. 2; comp Yer. Ta'an. 68d). He was also discovered weeping during his last illness, because death was about to deprive him of the opportunity of studying the Torah and of fulfilling the commandments (Ket. 103b). Judah is said to have recited daily the following supplication on finishing the obligatory prayers (Ber. 6b; comp. Shab. 30b): "May it be Thy will, my God and the God of my fathers, to protect me against the impudent and against impudence, from bad men and bad companions, from severe sentences and severe plaintiffs, whether a son of the covenant or not." Despite his broadmindedness toward Gentiles, he retained the ancient world's fundamental prejudice against women: "The world needs both the male and the female: but happy is he who has male children; and woe to him who has female children." (Pes. 65a; Ḳid. 82b; comp. Gen. R. xxvi.). Judah praises the value of work by saying that it protects both from gossip and from need. For him, the order of the world depends on justice. Zion is delivered by justice; and the pious are praised for their justice. A pair of charming stories exemplify the opposing sides of Judah's character, and the process by which he learned the value of mercy over strictness. The first tells of a calf being led to slaughter that broke free and tried to hide under Judah's robes, bellowing with terror. Judah pushed the animal away, saying: "Go; for this purpose you were created." Soon, Judah was afflicted with kidney stones, painful flatulence, and other gastric problems. He prayed for relief, but his prayers were ignored, just as he had ignored the pleas of the calf. The second tells how Judah's maid (or daughter) found some baby weasels in the house and was about to expel them violently with her broom. Judah stopped her, saying, "Leave them alone! It is written: 'His mercy is upon all his works.'" At this saying, a voice from Heaven was heard: "Since he has shown compassion, let us be compassionate with him." The rabbi was then healed of his painful illnesses and could once again go out in public. Judah's death is recorded in a touching account (Yer. Kil. 32b; Ket. 104a; Yer. Ket. 35a) which relates that no one had the heart to announce his demise to the anxious people of Sepphoris. The clever Bar Ḳappara broke the news to them in a parable in which heaven and earth were engaged in a kind of tug-of-war over the great rabbi: "The heavenly host and earth-born men held the tablets of the covenant; then the heavenly host was victorious and seized the tablets." According to the one Talmudic tradition, Judah was buried at Beit She'arim, where he had long since prepared his tomb (Ket. 103b); but, according to the work Gelilot Eretz Yisrael, his tomb was at Sepphoris. It is difficult to overstate the importance of Judah HaNasi's legacy for Judaism. His patriarchate continued his father's policy to restore amicable relations between the Jews and Romans after the tragic consequence of the Bar Kochba rebellion in which upwards of 100,000 Jewish lives may have been lost and the Jews were expelled from Jerusalem. More importantly, however, his collection and redaction of the Mishnah created the halakhic core around which the Talmudic tradition would be built. It was his work which preserved in written form the supposed Oral Law which gave later Judaism its basic character. An early saying of the Talmud demonstrates Judah's importance—that since the time of Moses, no one greater in knowledge and rank had arisen than Judah ha-Nasi (Giṭ. 59a; Sanh. 36a). While some Jews, notably the Karaites and today's Reform Jews, reject the Mishnah and the Talmud as binding, historically, the majority of Jews as well as contemporary Orthodox and Conservative Jews accept them, to varying degrees, as authoritative. Judah HaNasi thus stands as one of the greatest figures of rabbinic Judaism as well as one of the most important writers in Jewish history. This page was last modified on 6 September 2008, at 23:48.